It is no secret that botanical features lend themselves beautifully to knit motifs, be they of leaf, vine, bud, seed, cone, root and even tree shape. Leaves, particularly because of their myriad forms – ginkgo, fern, palm, maple, plane, lanceolate and more – can be found in every kind of knitted item you care to think of, and justly so. For all their beauty, leaves are surprisingly easy to replicate as knitted motifs: a lanceolate shape, for instance, requires but a few judiciously placed increases and deceases, and can be worked into a hat, a neckline, or to edge a scarf. 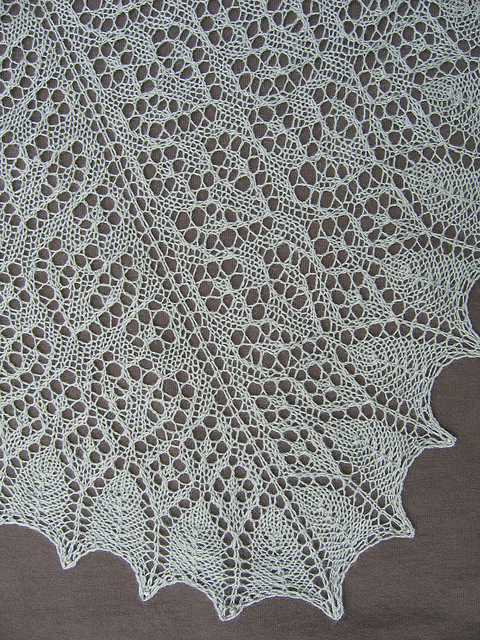 Leaf lace patterns with botanical features typically have a centre ridge flanked by yarnovers to mimic the vein structure. Kept small and repeated throughout a shawl or a sweater, the effect of botanical lace patterns is almost geometric. These patterns are mainstays of beautiful lace shawls such as those designed by lace mistress Evelyn A. Clark. The lacy tulips in this triangular shawl are made abstract and flattened out (and if you start one now, you can beat the tulips out in our spring). An allover delicate leaf pattern makes Autumn’s End by Botanical Knits author Alana Dakos truly special. (Look at that waist contouring!) We carry both of Alana’s books in-store; her patterns are very wearable and clearly written. Norah Gaughan is another designer famous for drawing motifs from nature (check out her book Knitting Nature, which is full of good ideas). Her cosy Knik shrug features sculptural leaf motifs, with close-fitting sleeves that balance out the positive ease in the body. Exaggerated and made a feature, botanical motifs can help create statement pieces of otherwise classic garments. Bristol Ivy’s Winterlong uses ellipsoid buds against a background of brioche stitch to make a stunning cowl. Sock queen Cookie A’s travelling rib sock Slide brings to mind long, strappy tropical leaves. Liz Abinante‘s Saroyan is knit in one piece, and is very adaptable depending on how much yarn you have and your attention span. You also have a choice of a single-sided leaf edging, or a double. Cecily Glowik MacDonald’s patterns always keep the shapes simple and let the details do the work of adding interest. Leaflet is a top-down raglan that plays it straight on the front, and surprises with a string of leaves on the back. The pattern calls for an Aran wool, so pick your favourite from Debbie Bliss, Jo Sharp or Rowan. The slightly embossed tree in Alana Dakos’ Bare Branches pops out of a reverse stocking-stitch background, and appears and disappears depending on how you wear the hood. This kids’ trio of vest, pullover and hat features cabled leaves, and comes in a wide range of sizing, from age two to twelve. 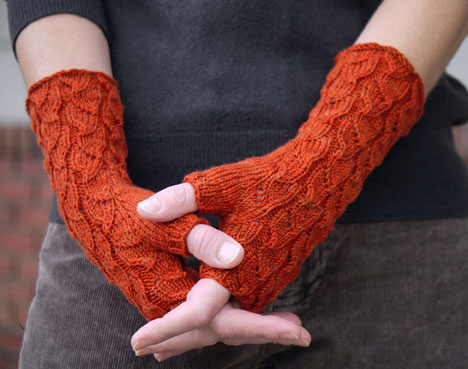 And, if you are prone to cold hands, chase away the winter chills with Anne Hanson’s Fallberry Mitts. Categories: Uncategorized | Tags: botanical knits | Permalink.